cDepartment of Radiology (M.H. ), New York University Langone Medical Center, New York, New York. SUMMARY: Parry Romberg syndrome is a rare progressive hemiatrophy of the face that typically occurs in children and young adults and has a peculiar progression that ceases without apparent cause after a highly variable period. Only a subset of patients with Parry Romberg syndrome will develop secondary neurologic or ophthalmologic symptoms, and prognosis is highly variable. Inconsistency in the pattern of atrophy and the development of associated symptoms in patients with Parry Romberg syndrome has made it challenging to diagnose, prognosticate, and treat. The precise etiology of this disease remains unknown, but some authors have implicated sympathetic cervical ganglion dysfunction, abnormal embryogenesis, autoimmune and inflammatory mechanisms, or vasculopathy as potential causes. We present 7 cases of Parry Romberg syndrome and their associated clinical and imaging findings with specific attention to the radiographic characteristics of this disease. Changes of cutaneous PRS may be subtle on imaging studies, but 20% of these patients will have intracranial manifestations that may not correspond to the severity of soft-tissue involvement or neurologic symptoms.13,18,20 Radiologic examinations may identify clinically occult intracranial involvement, facilitate the exclusion of other differential diagnostic considerations,15 and aid in monitoring disease progression.7 We present 7 cases of PRS to illustrate its wide variety of extracranial and intracranial imaging findings, along with a discussion of the clinical course, differential diagnoses, and treatment options. The role of the radiologist in diagnosis and management is emphasized. A 44-year-old woman with known right-sided PRS underwent CT for the evaluation of disease extent and cosmetic surgical planning. CT demonstrated thinning of the skin and subcutaneous fat of the right side of the face extending inferiorly to the suprahyoid neck. There was atrophy of the right platysma and muscles of mastication, with substantial asymmetry in the size of the parotid gland (Fig 1A). Osseous asymmetry was most pronounced in the maxilla and zygoma, though the right hemimandible was smaller than the left one (Fig 1B). Considerable right enophthalmos was present (Fig 1C). No brain imaging was performed. Axial CT images of a 44-year-old woman with PRS obtained for cosmetic surgical planning. A, There is prominent hemiatrophy of the skin, subcutaneous fat, and masseter muscle. B, The right maxillary sinus is considerably smaller than the left. C, Marked right enophthalmos is present. A 14-year-old boy presented with progressive atrophy of the left side of the face. CT and MR imaging examinations revealed hemiatrophy most prominently involving left-sided skin and subcutaneous fat, with lesser involvement of the muscles of mastication (Fig 2A). Skeletal findings were most pronounced in the mandible (Fig 2B). Enophthalmos of the left globe was present with relative paucity of retrobulbar fat (Fig 2C). No intracranial imaging findings were observed at the time of presentation. A 14-year-old boy who presented with progressive atrophy of the left face. A, T1-weighted image shows striking paucity of fat in the left face. B, 3D reconstruction of a CT series demonstrates left facial hemiatrophy, particularly involving the mandible. C, T1-weighted image at the level of the orbits reveals left enophthalmos. A 24-year-old man with progressive hemiatrophy of the left lower face and left facial nerve dysfunction during the past 3 years presented for imaging evaluation of symptoms. MR imaging demonstrated near-absence of subcutaneous fat involving the inframaxillary face extending inferiorly to the visualized portions of the suprahyoid neck (Fig 3A). Only minimal asymmetry was noted involving the muscles and skeletal structures (Fig 3B). Involved tissues demonstrated normal T1 and T2 signal without pathologic contrast enhancement (Fig 3C). Limited evaluation of intracranial content revealed no abnormality. Diagnosis of PRS was made, given imaging findings and compatible clinical history and examination. A 24-year-old man with progressive atrophy of the left face. A and B, Axial T1-weighted MR images demonstrate left hemifacial atrophy primarily involving the skin and subcutaneous fat; only subtle asymmetry of the masseter is noted. C, T2-weighted image at the same level demonstrates normal T2 signal in the affected structures. An 11-year-old girl with a known diagnosis of PRS of unknown duration was experiencing increasing dermal sensitivity and tightness of the left hemiface and occasional pain along the left temple for the past year. CT revealed soft-tissue atrophy and osseous asymmetry most prominently in the left maxilla (Fig 4A), with extension to the left frontal scalp superiorly and left mandible inferiorly. There was deviation of the nose toward the side of atrophy (Fig 4B). The maxillary sinus, ethmoidal air cells, mandible, and osseous orbit were relatively smaller on the left (Fig 4C). No dedicated intracranial imaging was performed. An 11-year-old girl with left-face sensitivity and left-temple pain. A, 3D reconstructions of a CT series show osseous asymmetry, most prominently in the left maxilla. B, Axial CT image at soft-tissue windows demonstrates deviation of the nose toward the affected side. C, Axial bone window demonstrates marked asymmetry in the volume of ethmoidal air cells. A 30-year-old woman with known PRS presented with weakness and recurrent headaches and underwent MR imaging of the brain. Subtle thinning of the subcutaneous skin and fat was seen along the right scalp (Fig 5A). On FLAIR and T2-weighted images, increased signal was present in the ipsilateral subinsular, temporal, and occipital lobe white matter and in the cerebral peduncle (Fig 5B, -C). Susceptibility-weighted imaging demonstrated innumerable punctate foci throughout the right temporal, frontal, and occipital lobes and in the cerebellum (Fig 5D). The left hemisphere was normal. A 30-year-old woman with a history of PRS who presented for MR imaging evaluation for weakness and recurrent headaches. A, Coronal enhanced T1-weighted MR image demonstrates mild asymmetry of scalp thickness with relative paucity of subcutaneous fat on the right. B and C, Axial FLAIR images demonstrate abnormal hyperintensity of the white matter in the right corona radiata, internal capsule, and temporal region. D, Axial susceptibility-weighted image demonstrates innumerable punctate foci of susceptibility throughout the right cerebral hemisphere. A 35-year-old woman with known left PRS presented with headache and weakness. MR imaging demonstrated increased T2 signal in the left hemispheric white matter. Involvement was geographic, with regional areas of confluent periventricular, deep, and subcortical white matter hyperintensity (Fig 6). The right hemisphere demonstrated only nonspecific punctate foci of white matter hyperintensity. A 35-year-old woman with a history of PRS presented for MR imaging evaluation for headaches and weakness. Axial FLAIR images demonstrate hyperinstensity in the left cerebral periventricular to subcortical white matter. The pattern of signal abnormality is geographic, with subtotal involvement of frontal, parietal, and temporal lobes. A 68-year-old man with known PRS presented with clinical acute right middle cerebral artery occlusion. Noncontrast head CT demonstrated marked thinning of the left frontal scalp similar to an en coup de sabre deformity (Fig 7A). MR imaging demonstrated findings consistent with right MCA acute infarction (not shown). The left hemisphere was markedly abnormal with extensive white matter signal abnormality (Fig 7B). Asymmetric left ventriculomegaly and a relatively small ipsilateral sulcal size (Fig 4C) were present and suggested hydrocephalus, but their etiology remained unexplained. A 68-year-old man with PRS who presented with acute right MCA infarct. A, Axial CT image demonstrates striking focal loss of scalp thickness in the left frontal region. B, Axial FLAIR images demonstrate confluent signal abnormality in the high left frontal and parietal white matter. C, Etiology of left ventriculomegaly and sulcal asymmetry was uncertain. In our case series, we demonstrated a variety of imaging findings in 7 patients with PRS. All patients had varying degrees of facial atrophy, and the affected extracranial structures retained normal signal patterns on MR imaging. Our first 4 patients underwent scanning for evaluation of facial findings. In 1 of the 4 patients, additional brain imaging was performed but revealed no abnormality. The remaining 3 patients with known diagnoses of PRS underwent dedicated brain imaging to evaluate neurologic symptoms; all had substantial intracranial manifestations with white matter signal abnormality ipsilateral to the side of facial atrophy being a consistent finding. 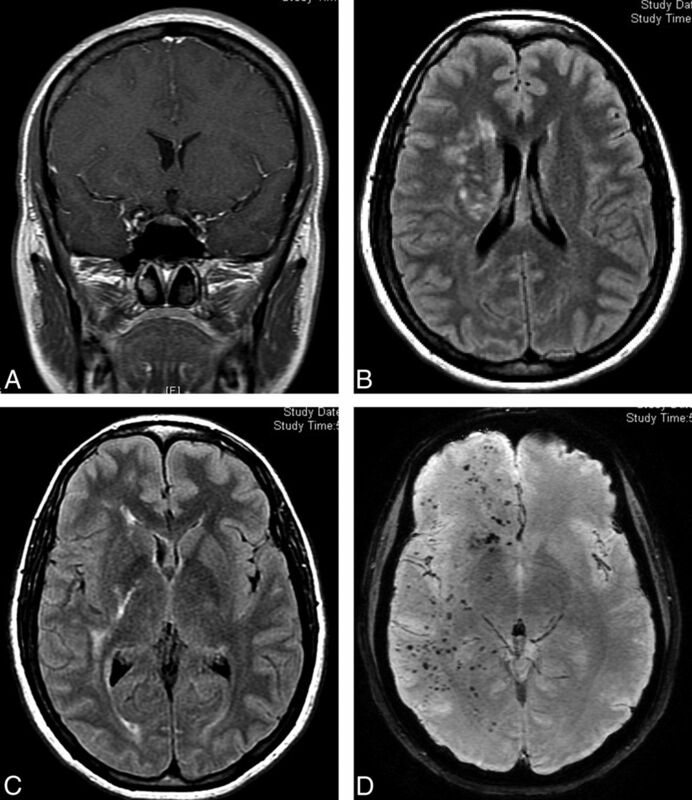 One patient demonstrated a striking pattern of innumerable foci of susceptibility in the ipsilateral brain—these may represent microhemorrhages or foci of mineralization. In another patient, unexplained ventriculomegaly and associated small sulci could represent underlying hydrocephalus or may reflect an as-yet-undocumented intracranial manifestation of PRS. In summary, PRS is a rare, self-limiting, and slowly progressive hemiatrophy of the face that typically affects the skin and subcutaneous tissues and may affect deeper tissues such as the musculature, cartilage, and osseous structures. Neurologic and ophthalmologic symptoms are common, but underlying pathophysiology remains uncertain. Intracranial involvement is best evaluated with MR imaging and can range widely, with the most common findings being parenchymal calcifications, white matter abnormalities, and brain atrophy. In addition to evaluating the extent of disease, radiologic assessments may also facilitate the exclusion of other differential considerations, help monitor disease progression, and evaluate posttreatment responses. Accepted after revision January 11, 2015.